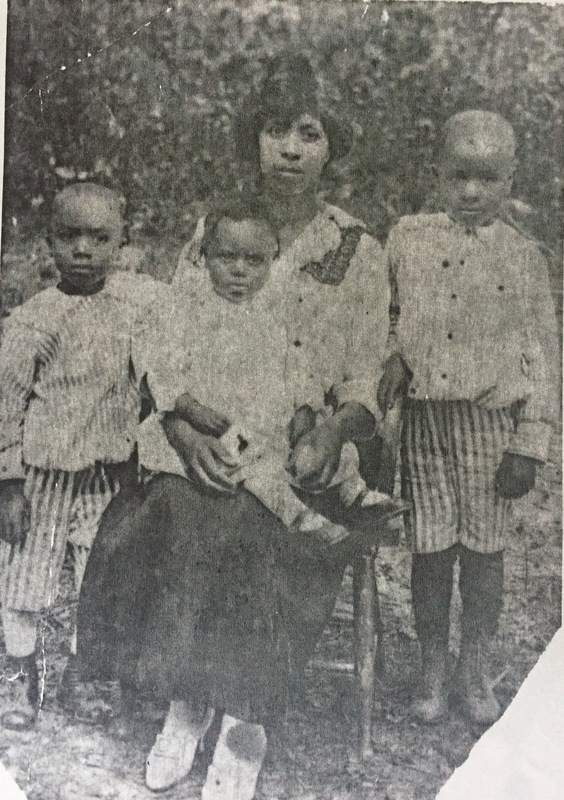 Chester, Mary Adell, Emiline and Marvin Woodard, circa 1920. In the 1920 census of Speights Bridge township, Greene County, North Carolina: on Harris Chapel-Howell Swamp Road, Johnnie Woodard, 28; wife Emma Line, 29; and children Marvin, 6, Chester B., 4, and Mary Adell, 21 months. In the 1930 census of Gardners township, Wilson County: farmer Johnie Woodard, 47; wife Emma L., 47; and children Marvin, 18, Chester, 16, Adell, 14, Vernell L., 12, James, 10, and Thomas W., 6; plus lodger John McCory, 28. In the 1940 census of Gardners township, Wilson County: Emiline Woodard, 48; and children Marvin, 16, Chester, 24, Mary, 21, Vornal, 19, Junious, 15, Helen G., 9, Bennie J., 6, and Thurman, 12. Emiline Edwards Woodard died 15 April 1971 in Wilson. Per her death certificate, she was born 20 December 1894 to a mother named Hagar and an unknown father and was a widow. Informant was Mrs. Mary W. Moore, 1008 Washington Street. Photograph courtesy of the family history booklet, Our Heritage 1812-1996: Edwards, Evans, Woodard, published in 1996, and graciously shared by B.J. Woodard. ← Snaps, no. 28: Drum line. MY BEAUTIFUL GRANDMOTHER, FATHER AND UNCLES. Your uncle Benny gave me a copy of your family history book, Chester. It’s a treasure! I grew up with Daryl, and went to school with Gary, Ronald and Johnnie K.
THE WOODARD HISTORY BOOK IS A FAMILY TREASURE. THANKS !!!! YOU SEEM TO KNOW MY YOUNGER SIBLINGS , UNCLE AND COUSIN. THANK YOU FOR YOUR ELABORATIONS AND ACKNOWLEDGEMENT OF MY FAMILY IN THIS FORUM. Yes, Daryl and I were born 2 months apart. And you’re very welcome. It’s a honor to have access to such a precious trove of family history.